How Big Should The Screen Size Be On A Phone? In the phone industry today there are a wide variety of mobile devices with various different screen sizes. The vast variety of mobile phones has increased dramatically that fortunately gives the customer a great choice to decide what phone suits them best depending on their required screen size. But what is the most ideal phone size for a regular customer? Back in the days when cellphones just started to appear – they were huge; mainly for the battery supporting them but also the electronics within weren’t as small as they are today as well as the fact the keypad should’ve fit in there as well. This large over sized phone quickly evolutionized into a small, compact, light mobile which could easily fit into the pocket of a pair of jeans. Along with that, the display got bigger, and the buttons got smaller. For most phone companies, this was the way forward; and the result of that meant that the phones were gradually getting smaller and smaller. Then there was a twist in the evolution path. Apple turned the trend upside down and came out with the iPhone which is noticeable bigger than the competitors. Many of the market sharks were surprised and didn’t believe it’ll work but the iPhone was selling faster than the rest of the competition, which led the market to a quick switch from making smaller phones with more features to have them bigger and bigger. This then led to the introduction of smart phones with the increase in demand of hardware requirements. Leading to a dramatic increase in the size of the screens whilst becoming touchscreen with only a few buttons. Samsung, HTC and Nokia all jumped on this band wagon and this then became the new craze within the phone industry. Geoff McCormick states that actually “The best size for a phone is a phone that can be used by a normal human being.” Which is displayed by the iPhone 5 as the screen size is designed so that every inch of the screen can be touched by the thumb whilst holding it in the palm of your hand; and this is why iPhone claim to note increase their phone size any more. Despite that, some sizes of phones like the Samsung Galaxy are far bigger than the iPhone 5 meaning it requires you to hold the phone in two hands to access the whole screen. 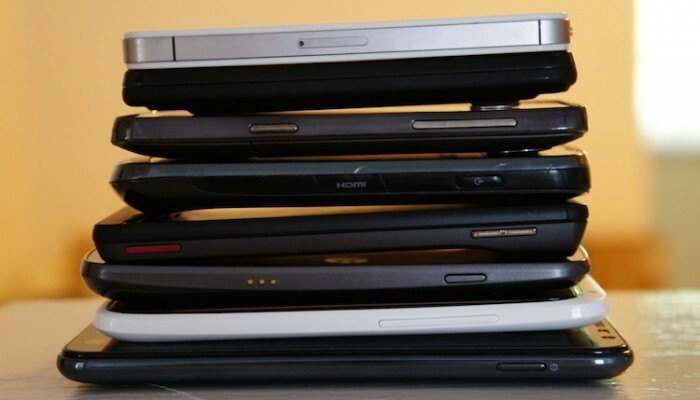 A step further to that is the introduction to tablets, that vary from around 8″ to up to 11″ in size. This is a new aspect to the market as some state they are just too big to carry around and that they are too big to carry out everyday functions like taking pictures. Along with this, designers are even talking about a grey area between the design of the phone and the tablet, known as the ‘Phablet’. This is more like an over sized phone that is too big to fit into a pocket. This means the user would have to carry it in their hands which is not the correct purpose of a mobile phone. So this new ‘Phablet’ design may not be as successful as first hoped. Another aspect that may play a part in the ideal phone and screen size is the new introduction to 4G. With more people wanting to play games, watch movies, listen to music online, surely the bigger the screen size, the better? So the ideal phone size depends on the users needs and wants. If the user want to use their mobile device as a multimedia center, having a bigger phone with a bigger screen will benefit them as the clarity of the image will be better and there will be less strain on the eyes. Whereas if the user is looking for a more practical phone they are best to go with a phone that can fit comfortably in the palm of their hand.